Mods: anyway we can drop the 2016 from the title? A few questions from a Modified Maniac . Don't get to see them much now since I am TOO involved with IMSA. Years ago the North East Modifieds use to run at Trenton for their so called race of Champions . Sadly no longer there but I seem to recall it was at least a 1 mile track . Is that correct ? The year I was there Neil Bonnet won it driving one of Bobby Allisons Coke sponsored modifieds as I recall it He also won the race ? Just curious how many big tracks the modifieds have run on over 1 mile ? I can only think of a few in the past 40 years . Pre that before NASCAR 's Now cup cars were often called Modifieds ? The tracks I can think of were Lime Rock once or twice ? Daytona Oval and infield course same as IMSA runs . Thinking DW won one of those? Trenton NJ as I recall had a Kink to it ? New Hampshire driven by Ryan Newman to at least one win ? Under 1 mile but the time I saw them at Bristol Tenn on the high banks was quite impressive ? They run two races a year at NHMS, that's the only track of at least a mile in length any more. You may have listed them all. Trenton was originally a half-mile dirt oval, which was then converted into a 1-mile dirt oval that was subsequently paved in 1967. A later revision created the iconic "kidney bean" oval that it's mostly remembered for - the kidney bean oval was 1.5 miles in length. Trenton was changed a few times before paving, and used to be one of AJ Foyt's favorite places to test. My dad has pictures of mid-week testing after flying him down from Nazareth, sadly before my time to join him there. And another one bites the dust, Irwindale Speedway will close at the end of the year for an outlet shopping mall. 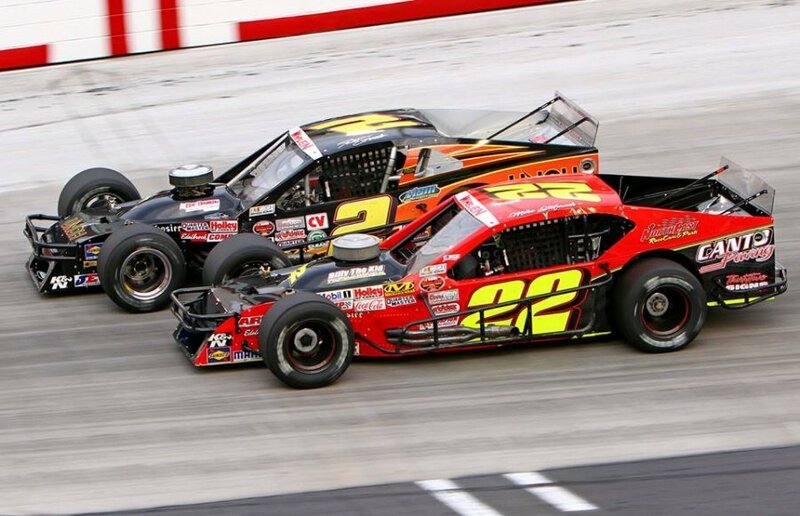 I have read through part of this thread start and end, will some one please put a picture of the type of modifieds it is aimed at. I hate these sheds on wheels. I agree, those things are one reason I rarely go to short track races unless the are sprint cars. But IMO more fun to watch than asphalt modifieds. Of course dirt sprint cars are even better. Disagree entirely on both counts. I mentioned this in grim reaping thread but worth mentioning here. Ted Christopher, modified legend, quite frankly, died this weekend in a plane crash. He was 59. Seems that every modified race that I've seen on my TV had Ted in the conversation. Condolences to his family and friends. I've been going to the Saturday races in both the summer and the fall at New Hampshire Motor Speedway since 2002, and I always remember seeing the black-blue and silver #13 modified...and in later years, his Red #36 competing for wins almost every time. Quite a shock to have found out about his death yesterday. Very sad indeed. On another note, I'll be making the trip again this coming weekend to Loudon for the Saturday races, and more importantly the last time the circle racers will be coming to Loudon for the September races, so I am sure there will be a fitting service for Ted.